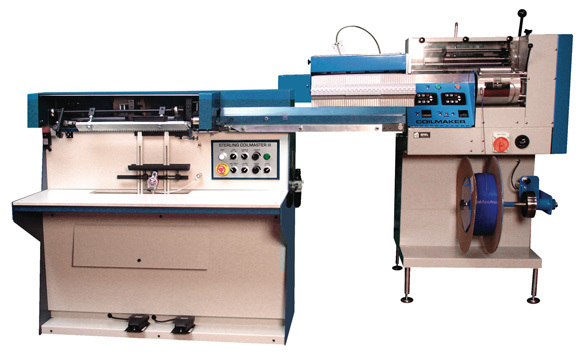 The Sterling Coilmaster III is a complete, in-line, plastic coil binding machine. Plastic filament is fed into the Coilmaker from a spool. It forms plastic coil on a mandrel within the Coilmaker. The formed coils are automatically fed into the Coilmaster®, which spins the coil into the book from the first hole onwards. The coil is then cut and crimped automatically. One operator can create coil and bind books at speeds up to 700 books per hour at the same time. The Sterling® Coilmaster III is a heavy duty automatic plastic spiral binder designed for high production. This machine binds books from 8 mm in diameter to 32 mm in diameter, and up to 50 mm in diameter with the optional thick book attachment. Spiral bind books as small as 4″ X 4″ up to calendars 17″ long. The machine can also be modified to handle larger books such as art pads.